You can add members to your group from the Members area of your group administration panel. In here click the Add button to reveal an area where you can enter email addresses and names of people you want to add. Enter one email address per line and a name is optional. The order of email address and name doesn’t matter. You may want to prepare your list of members somewhere else and paste them in, that’s totally fine. You can also drag and drop .csv or .xlsx files containing your members into this area, see bulk adding members. On this screen, there’s a “Send welcome email to new members” checkbox. 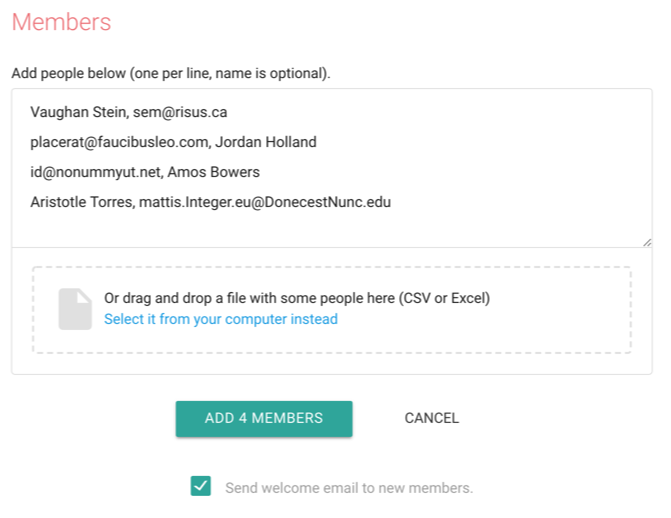 With this checked every new member will receive an email informing them of the group and how to use it. They will also receive a link to their own Member Settings page. You can see the default welcome email and customise it from the Design area of your group. Once you’re happy with your list of members and have decided if you’d like them to receive a welcome email just click Add.